The Foot Ferry! Because I can't swim across Sinclair Inlet! 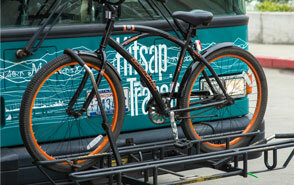 Kitsap Transit gets me to work every day! Thanks! Congratulations to Routed Operator Alice Drake and ACCESS Operator Mark Sjobom for earning 2015 Driver of the Year honors! Great drivers are a great reason to ride Kitsap Transit! Customer service, convenience and affordability. I love the routed buses #23, #25, and ACCESS. The new #23 route is very convenient, keeps me on my toes! ACCESS on Sunday would be a great service! Handicapped, and newly employed, I would love to be out on Sunday spending my hard earned cash. My Pastor, and my boss would love it too! Vanpooling saves money, wear on my car, and I find new friends. I enjoy our visits in the van and car on our way to work. Since I have a toll on my way to work, it saves on tolls. Also, our Kitsap Transit Coordinator is great to work with. When the weather gets rough or too rainy and cold I can take the bus home from the ferry terminal. Always friendly and nice are the drivers. You have some outstanding drivers. I just asked "Doug" his name today. He drives us home in the afternoon. He is so courteous. Daniel is very nice as well. I usually pick up the #86 to the ferry everyday. Thank you for all of them! Most of the bus drivers are so nice and friendly. Paul on route #13 keeps us laughing and he's always in a good mood... I love riding the bus here in Kitsap! I don't drive and use transit everywhere I need to go. Most drivers do their best to help riders however they can. Kitsap Transit gets me where I need to go! ALL of your drivers are the best, especially Nina on the #32/92, Jennifer on the #92 and Paul on the #13. I love getting off the Seattle-BI ferry every afternoon and watching the bus drivers engage in spirited conversations before we leave. Once on the way, they're all very happy and professional! Thanks for your hard work every day! I ride Kitsap Transit because I need a safe, reliable and practical means of transportation to and from my place of employment. It is also an important part of the overall solution concerning the reduction of negative impacts on the environment. Kitsap Transit operators provide that on a daily basis and deserve to be recognized for their exemplary efforts. Additionally, the operators appear to have the full support of their radio dispatchers and road supervisors, which is an integral piece of the formula for success. I am impressed with the helpfulness of the Call Center for helping me find a way from Point A to Point B. Our regular driver on route #33/90 goes above and beyond to accommodate his passengers. Morning and evening there are two young people who work in Seattle. One passenger, totally blind, has a service dog. The other passenger has cerebral palsy. The driver makes sure they are comfortably seated in the same place every ride. Both disabled passengers think of our driver as one of their best buddies. In addition, our driver has sprinted toward a Jefferson County bus, waving it down for his passengers to make their connection. I am a daily rider, both to college in Bremerton and then back home to Silverdale. I just wanted to say that I enjoy the rides and the friendliness of the drivers. They have great personalities and make the ride easy going and stress free. Thanks to all the drivers! You all do such a wonderful job! The Port Orchard drivers I have had contact with on the #9 South Park are so kind. Thanks! I stopped in with my vanpool to the Vehicle Maintenance shop and they topped off the fluids and made sure everything was winter ready. You guys have a wonderful, great crew down at the shops and I just wanted you to know that. Thank you! All the drivers that I encounter on the routes that I ride are courteous helpful and pleasant. They go out of their way to help and from what I see are genuinely nice people. They know regular riders by their first name-I like that personal touch. They are great. I really like them. My favorite driver is Stephanie. She is a wounderful person. She is very outgoing with people and there should be more people like her at Kitsap Transit. I would like to shout out two of your best drivers. The first one is Ardy. She drives the morning 90/33. She is always pleasant to us grumpy morning commuters and is very helpful to newbies. Ben is the other driver and drives the afternoon 90/33. He is very friendly and makes the afternoon commute tolerable with his jokes and kidding around with the passengers. I have ridden with KT for almost 14 years and it is these types of drivers that make my commute less stressful and relaxing. I just sit back and let them deal with the traffic. Now if something could be done about the Bainbridge Island traffic in the afternoon, things would be perfect!